We came out of Pennsylvania today on I-81, heading south. 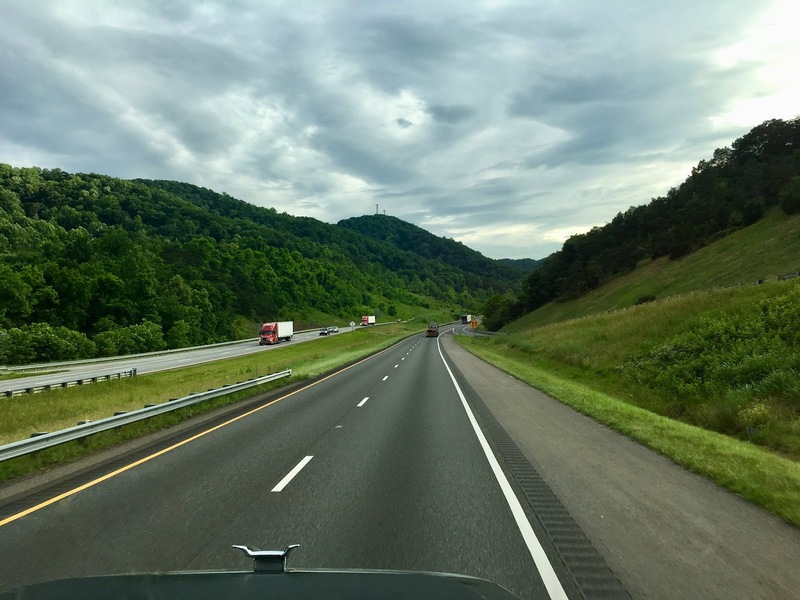 This is my favorite stretch of interstate in the country and the scenery this time of year is so spectacular, especially in Virginia and Tennessee. Rolling hills, super-green pastures, and trees as far as the eye can see. Definitely my favorite landscape. We were following the rain, which was likely responsible for the lush, glistening greenery. They've obviously been getting a lot of it because we did see some extremely swollen rivers and some flooded roads and pastures on each side of the highway. This picture was taken in Virginia as the rain died down, eventually letting up completely by the time we got to Bristol on the Virginia-Tennessee state line. We made our way into Tennessee and started looking for a place to park so we could eat dinner and relax for the evening. Only 700 miles to go before we hit our final destination!